In the first installment of a new section for Off-Road.com called Shop Project, we will highlight the unique and progressive off-road vehicles built at off-road shops across the country. Shop project vehicles are often platforms to test new product, experiment with new designs, or simply to create the ultimate trail vehicle – sometimes it’s a blend of all these concepts. 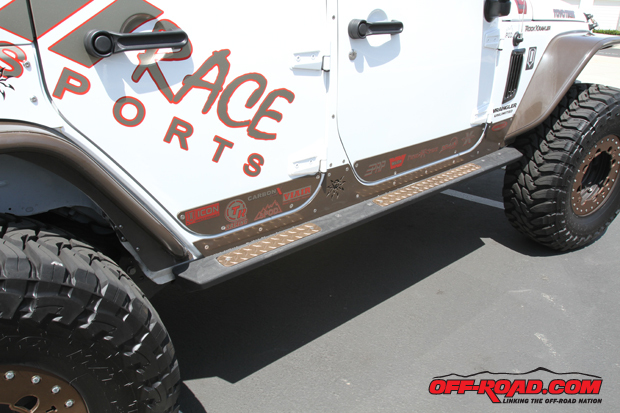 For Road Race Motorsports in Santa Fe Springs, California – a shop that focuses on builds and performance car parts for the road race realm, rally racing and off-road – the opportunity to build a 2012 Jeep Wrangler came last year just before the SEMA show. With strong interest from potential companies participating in the build, they went ahead and took on the challenge with only about six weeks until the show. Building a show-quality vehicle is nothing new for the Southern California-based shop, which opened its doors back in 2000 and has helped build SEMA Show vehicles for Suzuki, Mitsubishi and Kia. Owner of Road Race Motorsports Robert Tallini is a road race and rally champion himself, and in spite of the name the shop actually does quite a bit of off-road work. Tallini has raced off-road himself, but injuries over the years pushed him into other forms of racing. “I raced the Mint 400 20 years ago, and I worked in a shop building cars for Mickey Thompson, literally, as well as Paris-Dakar buggies before the Eurpoeans knew what an open-wheeled off-road buggy was,” he explained. 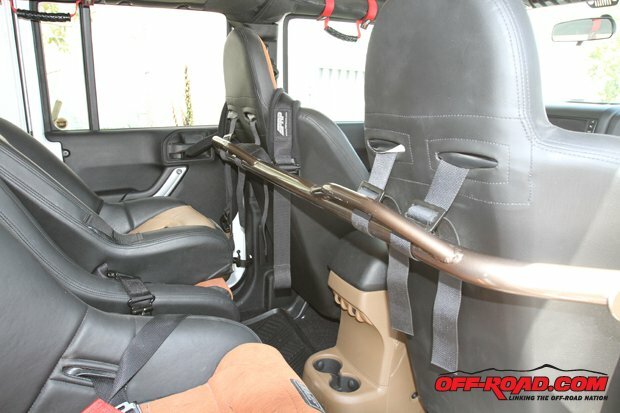 For the 2012 Wrangler build, RRM decided to create a vehicle that was off-road capable but also ready for the long haul. John Rocha, an avid off-roader who has worked in the industry for years, helped the shop with the concept and execution of the build. “Our approach was not to make it a rock crawler but to make it more of an overland-style rig,” Rocha said, who went on to explain the idea was to make the Wrangler functional and capable with a low-center-of-gravity design. 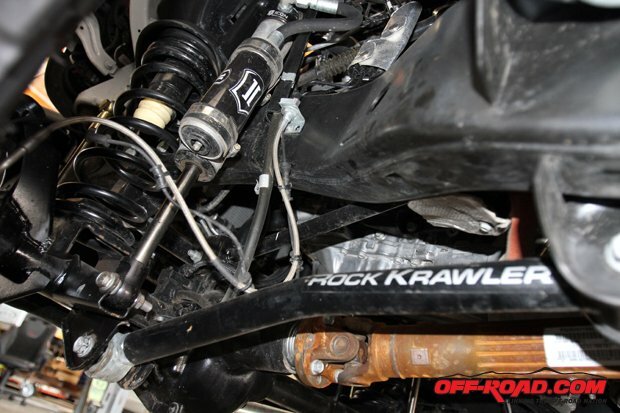 Along this line of thought, providing trail clearance for the RRM ’12 Wrangler is a 2 1/2-inch Rock Krawler Max Travel suspension system. Specifically tuned 2-inch Icon shocks help soak up the bumps on the trail. 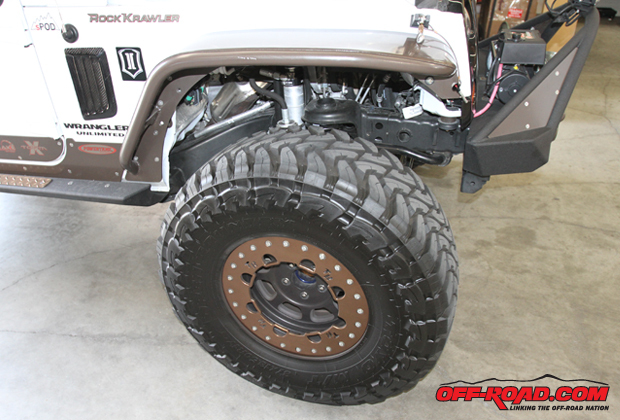 RRM also squeezes 37-inch Toyo Open Country M/T tires on the JK. The Toyos are fitted on 17-inch Trail Ready beadlock HD wheels, which RRM had hard-anodized in “Tuxedo Black” instead of powder-coating for protection and clean look. Poison Spyder is another major contributor to the build, and its Front Crusher fender flares help provide the proper clearance for the 37-inch Toyos. The Wrangler also features Poison Spyder’s Brawler Rockers for side protection and for a side step for entering and exiting the Jeep. These aluminum PS parts are a great compliment to the overland-style rig, as keeping unnecessary weight down is important. To provide added protection, RRM utilized door armor on the ’12 Wrangler including its own JK door armor piece that is constructed of 3/16-inch 6061 aluminum that is painted to match. Poison Spyder B-Pillars also provide door protection to prevent this area from buckling or collapsing if hit by a tree or other obstacle. The front of the vehicle is equipped with a Poison Spyder Brawler front bumper with the tube-gusset design at the request of the shop. RRM added a color-matched piece to fill in the opening on the side. 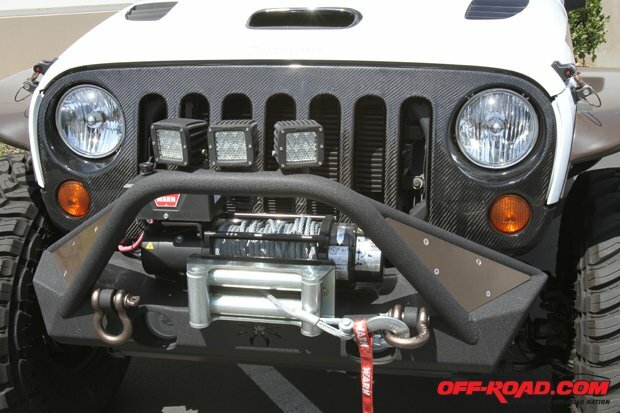 A Warn VR10,000 winch is fitted on the bumper to get the Jeep out of any tough spots on the trail. Just behind the bumper is RRM’s carbon-fiber grill, an eye-catching piece that isn’t performance enhancing but certainly gives the ’12 JK front a unique look. A part that does provide more of a noteworthy benefit, however, is what RRM refers to as its “functional” JK hood, which is designed to accept cool air in and dissipate heat through “shark gill” side hood vents. 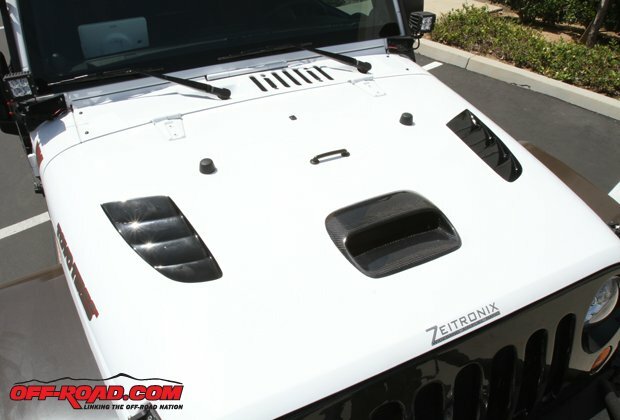 Drake Off Road JK hood latches help keep the hood in place. RRM also employs small vents on the side of the JK just behind the doors to help reduce drag from a closed airflow section by letting air flow through – a concept the shop borrowed from rally racing design concepts. 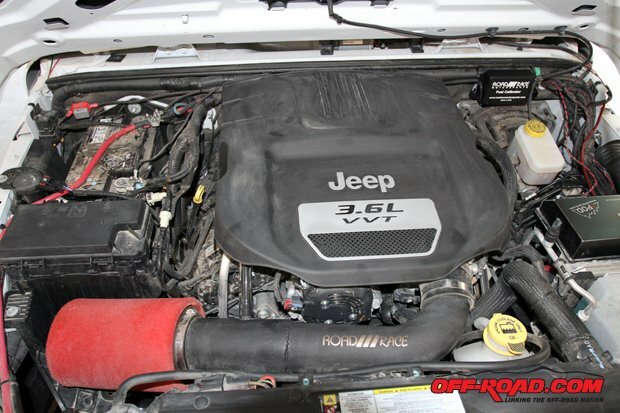 Under the hood, RRM equipped its air intake system for the Wrangler JK, which opens up the restrictive stock air intake system for more power and also a good compliment to the RRM hood design. 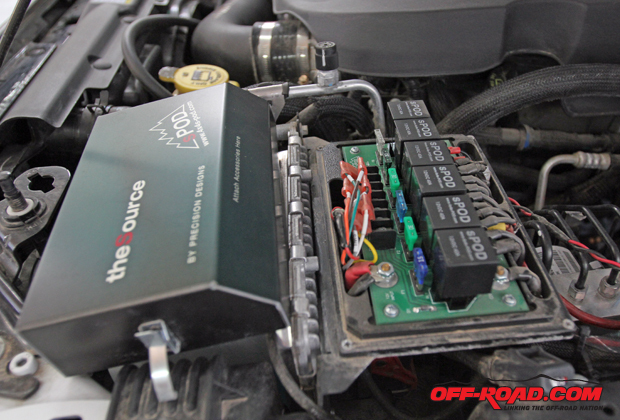 RRM also installed its Fuel Calibration System, which is a piggyback system that acts pre-ECU so it requires no tuning and will actually communicate with the ECU to improve power and fuel economy. 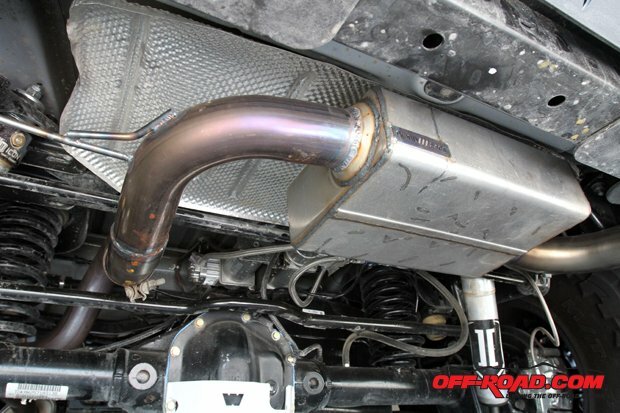 RRM equipped the ’12 Wrangler with its axle-back exhaust system that actually tucks up higher than the stock unit and places the ppe exit higher for added trail clearance. Most importantly, the system provides performance improvement while not providing an overly loud or obnoxious tone (as Tallini notes, the pitch is wife-approved). Rigid Industries LED lights provide additional off-road lighting for the RRM Wrangler, as three LED floods are used on the bumper itself, while two 4-LED lights are outfitted on each side of the front window. Atop the Wrangler’s front roof is a Rigid 50-inch E-Series light bar. For added storage, a Garvin JK roof rack is installed that RRM fitted with customized side aluminum pieces that are color-matched to the vehicle’s design. 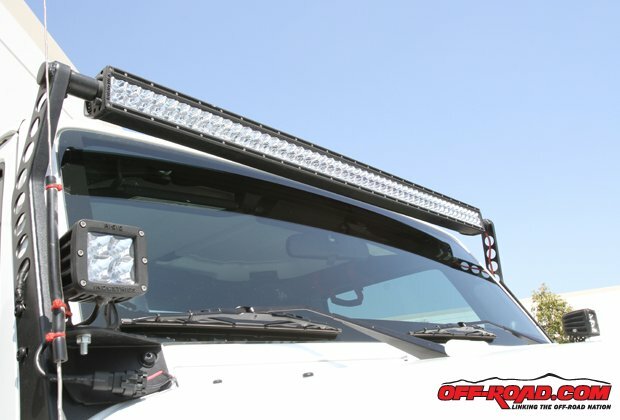 The rack does feature additional Rigid lighting in the form of a SR-10 LED lightbar on each side, as well as two SR-6 bars at the rear of the rack. At the rear of Wrangler is a Poison Spyder RockBrawler Spare Tire Carrier, which is fitted with the optional CB antenna mount and Hi-Lift jack mount. RRM also outfitted its Rotopak mount into the bumper as well as an added strut for stability to reduce any rattle on the road or trail. 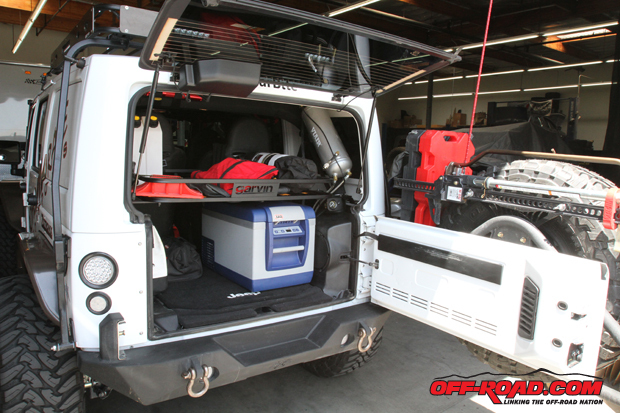 X-Torm 4WD helped supply the RotoPaxs on the Jeep, of which there are two 4-gallon fuel tanks and two Pax that are lockable tool kits. RRM also installed one Rigid Industries LED that can swivel to provide added light when accessing the tailgate on the trail. Another thoughtful addition is the small hook added on the RotoPax strut for a Trasharoo (or trash bag) for the trail. The OEM rear taillights are replaced with Truck-Lite LED lights. 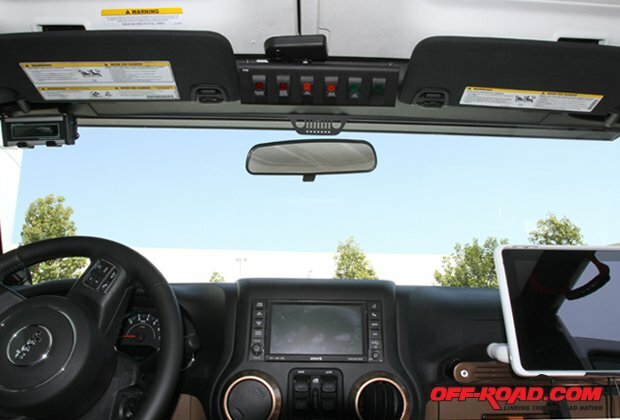 Inside the rear of the Wrangler, RRM has an ARB refrigerator to keep perishable food fresh. Another Garvin storage rack is utilized in the tailgate storage area to hold tools and two 1-gallon water RotoPax (stored inside to keep them cooler). 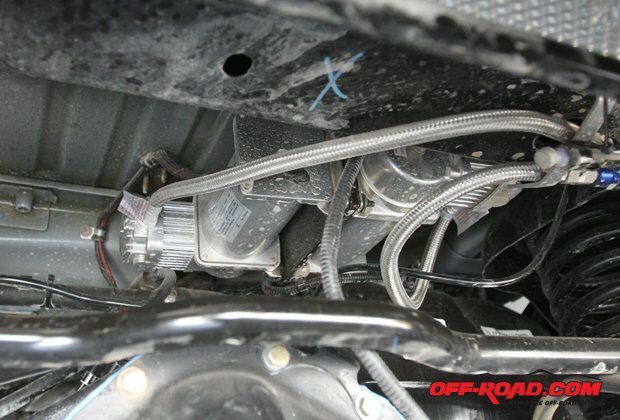 Also inside is the Viair two-gallon compressed air tank, which is connected to two compressors that are mounted under the rear of the JK. As a “just in case” backup plan, a Powertank is also stored in back of the Wrangler. 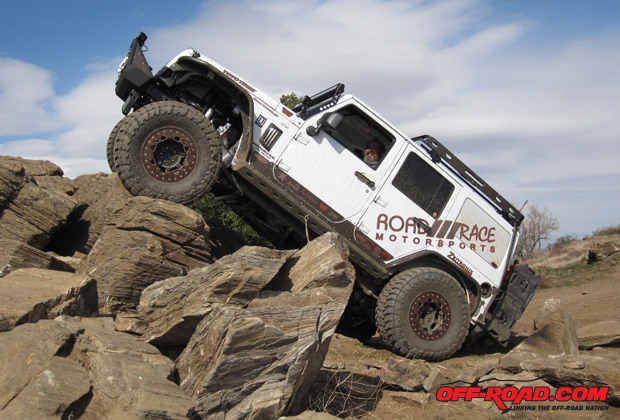 Under the 2012 Wrangler, RRM retained the stock Dana 44 axles but installed 4.88 G2 gears in the front and rear. The front axle was gusseted for added strength and Poly Performance sleeves reinforce the front axle as well. Stopping power for the Wrangler is provided by 13-inch slotted rotors on the front brakes, while the rear are RRM feaure slotted stock rotors – another concept borrowed from the shop’s racing background. All in all, this 2012 RRM Jeep Wrangler is not only pleasing to the eyes, it’s competent and confident on the trails. The low-COG design can tackle some serious obstacles, while the rig is equipped with the proper upgrades and safety measures for remote off-road adventures.